to wake up and see the Christmas lights. Wonderful shot with all of that heart shaped bokeh. I can just imagine minions getting very, very excited. Fantastic, love the heart shaped bokeh. So cool! 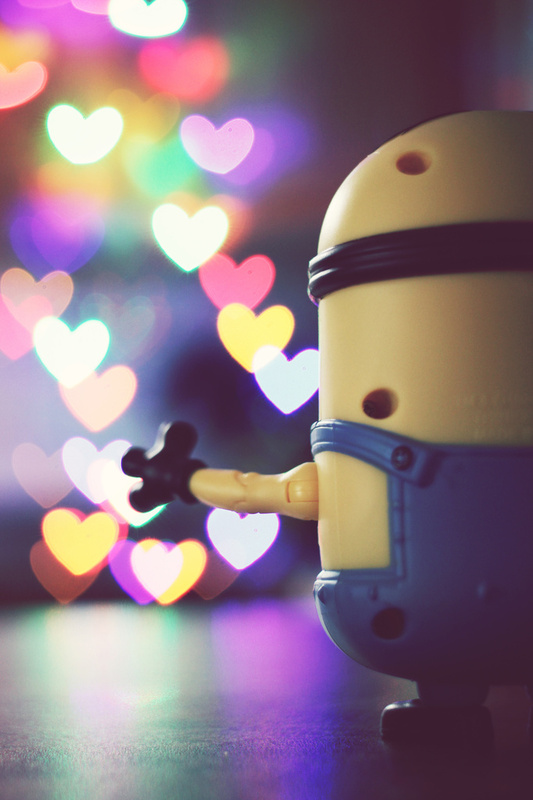 Great use of the minion and bokeh! Too fun!! Trust me. Minions DO get that excited. Wonderful shot, Allison. It just jumped off the homepage right at me. FAVed. ah love the heart shaped bokeh, I'm still yet to try this. Too cute. Love the bokeh - what's the secret to it ? Love that heart shaped bokeh! @allisonraposa Thanks for the links Allison. I will definitely do some investigating, cheers. This is so cute! Love your minion series!! Amazing shot - FAV - love this! so cute! and beautiful bokeh! ROFL, so cute. Nice concept very creative. This is a fabulous minion shot! :-) I can see the minion getting very excited. The heart bokeh is wonderful. Hmmm, they told me Monday. I guess December being their busiest shipping time it will take longer than expected. Still, for the $8.00 shipping charge you'd think it should've been there by now. Sheesh! Super cute and love the heart bokeh! Brilliant, Made me smile. I love Minions, I want to be one when I grow up. Awesome, great shot and perspective! Fave! Congratulations for making it into the finals of the theme challenge! You rock the themes and you gave my vote! OMG! I saw that this made the finals of the theme. I take minion pics from time to time too! I did a whole month of them back a few months ago. great shot!